Tuesday night's double-elimination night on NBC's The Voice sent two artists home after a high-stakes instant save vote. The bottom three artists all had to sing live for the instant save, which only spared one. The remaining eight artists advanced to next week's semifinals. For the second week in a row, all of the artists broke into the iTunes Top 100. Coaches Blake Shelton, Gwen Stefani, Alicia Keys and Adam Levine anxiously awaited results as the competition headed into its final weeks. Country singer Maren Morris performed her single "I Could Use a Love Song" to open the show, followed by a cute Mother's Day package. Then it was time to get on with the results. 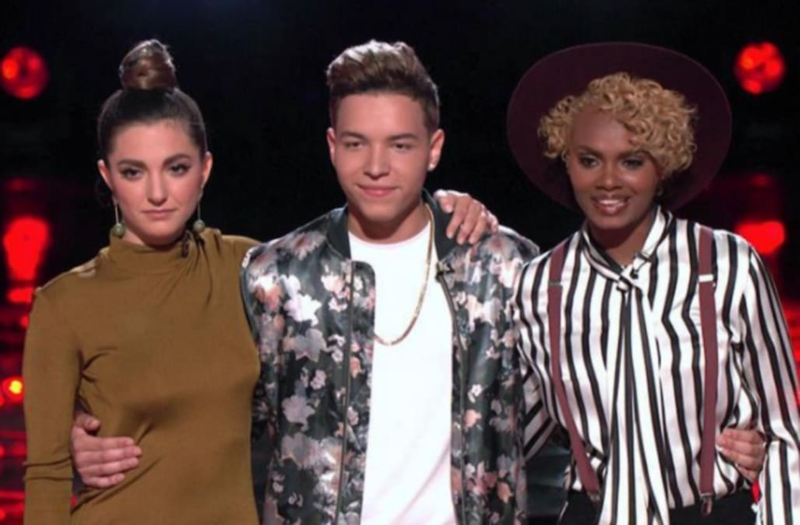 Carson Daly brought the top 10 artists and announced that America voted to save Team Blake's Aliyah Moulden and Team Alicia's Chris Blue, who held the 21st and 22nd spots on the iTunes charts, respectively. Blue's rendition of "24K Magic" was particularly impressive on Monday night, showcasing that he has the full package as an artist and performer. Moulden gave an emotional performance in honor of her late father. America also voted to save Team Blake's Lauren Duski and Team Gwen's Hunter Plake, the only two artists to break into the top 10 on the iTunes charts this week. Both have been gathering momentum, especially Plake, who has really been coming into his own over the past couple of weeks. Team Adam's Jesse Larson and Team Gwen's Brennley Brown were also voted through to the semifinals. Both of Stefani's remaining artists made it through, allowing the coach to rest easy about the upcoming instant save showdown. The last artist to automatically advance to the semifinals was Team Blake's TSoul, which also meant all of Shelton's remaining artists were safe. That left Team Adam's Lilli Passero and Mark Isaiah and Team Alicia's Vanessa Ferguson to sing for the instant save. Only one could prevail. First up was Passero, singing the jazz standard "Stormy Weather." It was a similar performance to Monday night's, with Passero striking a balance between classic and current, singing with conviction and tight vocals. She put a little more of her own twist on the song than she did last night, making it more memorable. Isaiah, who had to sing for the instant save last week and the week before, was no stranger to being in this position. This time around, he sang "Sorry" by Justin Bieber, and while it was a solid performance and good song choice, there clearly is something about the artist that just isn't clicking with viewers if he keeps ending up in this position. It's difficult to imagine him pulling off a comeback big enough to get him into the finale in two weeks. Ferguson closed out the instant save performances, singing "For Once in My Life" by Stevie Wonder. Of the three, Ferguson is the most dynamic and versatile artist, and she sang beautifully. Keys and Levine both pleaded with viewers on behalf of their artists. Winning the live vote on Twitter, Ferguson was the last artist to join season 12's top eight. Both of the Team Adam artists went home, but Levine still has Larson to represent his team in the semifinals. The top eight perform in next week's semifinals, when viewers have the chance to vote on who makes it to the season 12 finale. Who are you rooting for?